Why shop Comfortis for Dogs? 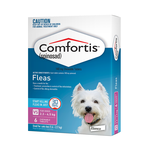 Dog Comfortis is one of the most powerful and effective flea treatment brand on the market. 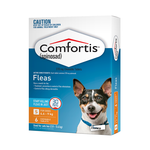 Because Comfortis kills adult fleas, rather than just interrupting their breeding cycle, it can be used in dogs either as a flea prevention, or as a flea treatment for an active current flea burden. How often do you have to give Comfortis? Comfortis is a monthly tablet. This once-a-month regime makes it easy to use and remember. How long does it take to work? Comfortis is very fast acting and starts to work within 30 minutes of administration. It kills all fleas within 4 hours and then works for an entire month. Because Comfortis is a chewable tablet, you don't have to worry about it washing or rubbing off. 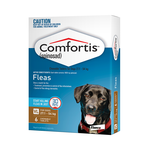 Comfortis is trusted by veterinarians worldwide and has been used for years. The active ingredient in Comfortis is Spinosad. Comfortis is available in Comfortis Pink for dogs weighing 2.3-4.5kg or cats weighing 1.4-2.7kg, Comfortis Orange for dogs weighing 4.6-9kg and cats weighing 2.8-5.4kg, Comfortis Green for dogs weighing 9.1-18kg and cats weighing 5.5-11.2k, Comfortis Blue for dogs weighing 18.1-27kg, and Comfortis Brown for dogs weighing 27.1-54kg. 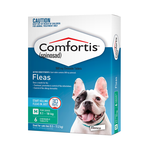 Pet Circle has competitive prices to ensure we sell top quality pet products like Comfortis at the cheapest possible price.